JustCloud is the PUP that uses misleading techniques to prevent removal. Use Reimage to locate malicious components and get rid of them faster than with uninstall instructions. A full system scan blocks virus reappearance and prevents traffic to malicious domains. How can JustCloud hijack my computer? How to remove JustCloud virus? 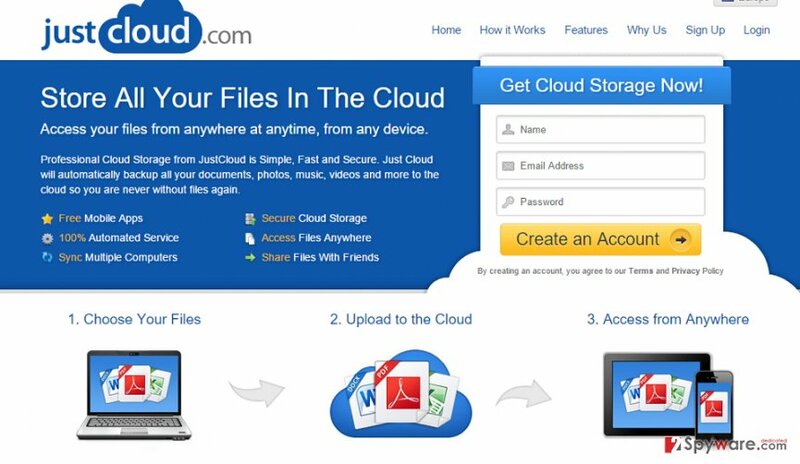 JustCloud from JDI Backup Limited is a professional Cloud Storage that is said to be “Simple, Fast and Unlimited.” This tool is extremely handy since it may automatically backup personal files, sync files across computers, allows sharing, editing files, and other useful services. However, you should keep in mind that this cloud storage is considered to be a potentially unwanted program (PUP) that should better not be used. It should be mentioned that in its sole purpose and functionality, JustCloud is equal to Google Drive, OneDrive and many cloud storage. However, there is one important aspect due to which it has been categorized as a PUP – its distribution technique. Security experts have noticed that it is commonly spread bundled with other freewares along with adwares and browser hijackers. On top of that, when you get this program via software package, don’t expect that it will show you all its capabilities. This way, you can only get a free trial version that allows uploading up to 1GB of information. Therefore, whenever you exceed the limit, you may be asked to purchase a Premium / Ultimate version of JustCloud. In contrast, free version of another reputable cloud storage allows uploading up to 15 GB information. Therefore, we do not recommend you to pay the money for the program that can easily be replaced by another. By the way, do not underestimate the fact that JustCloud virus tends to spread bundled with other potentially unwanted programs. Keep in mind that it may help such programs as MyPc Backup, SimpleFiles, DNS Unlocker, etc. enter your computer’s system, what means that you may start receiving tons of sponsored advertisements, redirects, slowdowns, and other issues that you certainly do not want experiencing. Therefore, if you have recently installed a software pack, you are strongly advised to remove JustCloud virus using Reimage or another reputable because it’s the only way to get rid of it and other potentially unwanted programs that might have been installed along side it. JustCloud can be downloaded from the official website (JustCloud(dot)com). You can try a trial version or buy its full version there. Nevertheless, you may find this storage running in the background of your PC’s system without downloading it there. How is that possible? This can happen quite easily. JustCloud may be attached to various freewares and sharewares as an ‘optional download’. Therefore, if you will skip Advanced/Custom settings unchecked, this component may easily end up on your PC’s system. By the way, usually it’s not the only ‘optional component’ attached to a freeware. It may be bundled with several third-party add-ons, plug-ins, toolbars or extensions, so inattentive freeware’s installation may cause infiltration of a whole bunch of programs. That’s why you should never forget to check Advanced/Custom settings and untick optional downloads that are traveling set by default. Nevertheless, we highly recommend you to rely this task for Reimage, Malwarebytes MalwarebytesCombo Cleaner or Plumbytes Anti-MalwareMalwarebytes Malwarebytes because, as we’ve already mentioned, JustCloud is usually spread in one pack with adwares and browser hijackers. This entry was posted on 2015-09-23 at 23:15 and is filed under System tools, Viruses. You can quickly scan the QR code with your mobile device and have JustCloud manual removal instructions right in your pocket. How did you remove JustCloud?